Leading up to World Sleep Day, drive global awareness for the importance of sleep and insert Philips organically into the conversation. Invite international influencers on an exhausting three-day road trip to share sleep deprivation stories. Eight influencers ‘traveled like rock stars’ on a tour bus from LA to Austin to attend Sleep - a Philips-sponsored concert at SXSW. Along the way, influencers visited iconic landmarks and shared the impact of sleep deprivation on their social channels using #NoSleepTilAustin. Additionally, their experiences were recorded & released as a content series, distributed via Philips’ paid social channels. 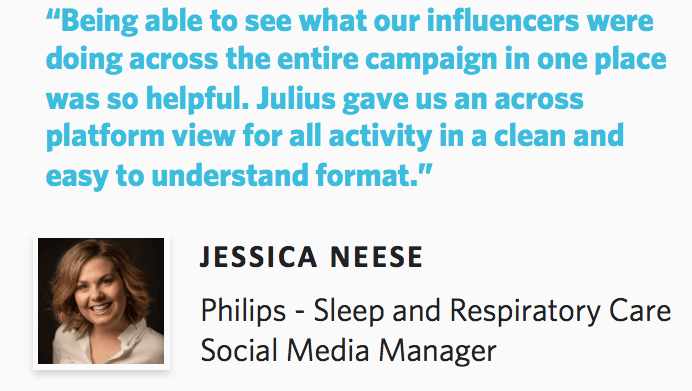 Submit your details to find out how Philips used Julius to create impactful content using the right brand-aligned influencers.